The WordPress + PhotoShelter combo is a very effective way to power a professional photographer’s website. The advantages include greater design and organization flexibility, more SEO options, unlimited room for content, user-friendly admin interfaces, full e-commerce-enabled photo archive management and a low cost. The main downside is the requirement of the photographer to learn and play with a new and somewhat technical system. Combining WordPress and PhotoShelter has long been my favorite way to power the photography websites of my clients. Together WordPress and PhotoShelter offer a number of advantages that are particularly suited to the needs of the professional photographer with better things to do than learn coding. These include excellent design and content organization flexibility, improved SEO capability, unlimited room for content, user-friendly admin interfaces for editing content and images and full e-commerce-enabled photo archive management. That is not to say that they cannot serve separately as a stand-alone platform for a photography website – indeed many photographers pick one or the other – however I would argue that the WordPress + PhotoShelter combo is the most effective and complete solution for the serious pro photographer. NB: by WordPress is am referring to the self-hosted version of WordPress, not wordpress.com (see distinction below). In effect – if not in appearance (more on that below) – when I set up this system I build two separate websites, one on each platform. Typically, WordPress, sitting on my hosting server, will power what I call the portfolio site: homepage, portfolio pages, all the blog content and most of the static pages (About, Contact, etc.). While PhotoShelter, sitting on the PhotoShelter servers, takes care of the photo archives: image galleries and collections with full e-commerce ability (for print sales and licensing) as well as user access control for image delivery, archive search tool. This pairing largely views PhotoShelter as an essential add-on to the WordPress portfolio site providing the latter with a full blown online image archive capability to manage all image interactions with clients. See my portfolio photography site and my online photo archive site. Where the WordPress/PhotoShelter separation will fall can vary depending on the requirements of the project and the photographer’s preferences. For example a page selling prints can just as easily be a WordPress page with the appropriate plugin or a PhotoShelter gallery. Even a portfolio page can run on either (although there are reasons to prefer WordPress over PhotoShelter for this). But generally the portfolio / archive division of labor stands. Done properly the design of the two sites should be identical enough that visitors don’t notice they switched platforms when they navigated from, say, a portfolio slideshow page to an archive image gallery. In the example below notice how not only the header appears to be fixed while you move the slider but the overall styling is clearly related? Open the actual pages in a browser to see what I mean: Portraits portfolio page and Gallery List page. There are a few unavoidable giveaways such as the URL of some archive pages that cannot use a custom domain name for security reasons but I am willing to bet 99% of visitors don’t notice the switch. So why go to the lengths of building two websites? 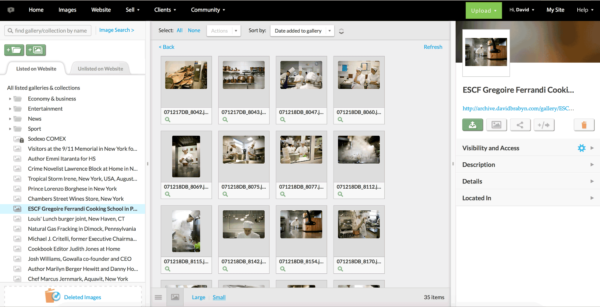 WordPress adds several capabilities that PhotoShelter lacks. The most obvious is blogging. This can be useful even if you don’t want to have a blog. Technically blogging is no more than the regular posting of updates on a site, these can be as short as news alerts, notifications, links, etc. and don’t have to involve the writing of full length articles on a given topic, which is what one typically thinks of as blogging. You could run a news ticker on WordPress. Keep in mind also that while you might not need to post updates to your site right now you might want to later when you win that Pulitzer or the global advertising campaign you shot comes out. You don’t have to use the blogging ability until you need it but at least, if you use a tool like WordPress, it will be available when you do. WordPress is also an extremely flexible tool when it comes to organizing your content. It allows you to add an unlimited number of pages which can contain text, video, audio and more – all of it easily editable. Pick from about 29,000 plugins (bonus: most of them are free) and you can add pretty much any functionality you can think up: slideshows, collect payments, list posts by popularity, integrate social media tools, even let users add clovers and leprechauns to your webpage. If you know how to code (html, css, js and php) then WordPress becomes the pure engine and around which you can build your custom chassis and do almost anything you want. Both platforms have simple admin interfaces that you will log into to add, edit and organize your content. They can both seem little confusing at first as they are unique systems and are not based on anything you will have previously encountered but the learning curve is short. Most users find them both very easy to use. WordPress in particular has a very large fan base. The WordPress – PhotoShelter combination is also a very affordable solution. WordPress is free open source software that you install on your hosting server. At $329/year for the Standard plan, PhotoShelter – considering all it does – is remarkably cheap (make sure you use a discount code when you sign up). Themes – the skin and bones of all WordPress sites, i.e. the design and content organization – are also very inexpensive. A huge market for WordPress themes has developed over the years and some astonishingly well designed themes can be found for under $50. Plugins, as I mentioned earlier, are mostly free. The Google visibility of the homepage of a WordPress-powered portfolio site will be superior to that of a PhotoShelter-based homepage. The reason is that your WordPress-based homepage will be located at the root of your domain name: yourdomainname.com rather than in a sub-folder of the PhotoShelter domain name: yourphotoshelteraccountname.photoshelter.com. That gives you more autonomy to develop your own SEO strategy and it tells Google that your site is a separate entity rather than a child of PhotoShelter.com. Of course this is true for any stand-alone site, not only WordPress-powered sites. In addition several plugins, like WordPress SEO by Yoast, let you easily tweak your SEO rather finely. As for your photo archives PhotoShelter has produced a detailed and free guide to search engine optimizing a photo library. Keep in mind that the goals of – and therefore the logic behind – optimizing a photo library and a homepage are quite different. This setup has few downsides but they are not insignificant enough be entirely ignored. All these advantages don’t quite come for free (even if WordPress is) like for example a Tumblr website. You’ll need to get your own hosting. You could set up a server at home but most people will prefer the simplicity of buying hosting from a third party provider (I highly recommend WPEngine). That will set you back anything from about $8 to $30/month. You will need to register a domain name (I recommend Namecheap, see link below) for about $5/year. You may also need an email account ($4 to $10/month) if a free one isn’t bundled with your hosting account. Buy a couple of plugins ($20 to $70 each, maybe). All that adds up but is still very cheap for a complete shop window for your business. You might also want to hire a web designer to help you build your site, to build a custom theme for you and to custom code the PhotoShelter pages so that they match the portfolio site. This will cost you from a few hundred to a few thousand dollars depending on the scope of the project. While using WordPress is pretty straightforward there is no doubt that it requires at the very least a willingness to get your hands a little dirty. The WordPress manual, the CODEX, is extensive and largely kept up to date but it was also clearly not written for beginners. The better designed commercial themes will come with instructions and be configurable via drag and drop action, checkboxes and options fields that go a long way towards simplifying their use. Nonetheless all users will need to understand some jargon and the basic principles of how a website works. For example you will need to set your permalinks options, understand what the different image sizes in the Settings page mean, learn how to add simple html tags in your posts and possibly upload files to your server via FTP. None of it is rocket science but the fact is some people’s eyes glaze over at the sight of web tech stuff, understandably so. In addition, with a self-hosted solution like WordPress you are basically on your own when something breaks. You can ask your hosting provider, your theme’s author, Google or you developer cousin for help but at the end of the day it’s your website and your problem. I had one client who’s workflow was so intense and shoots so frequent that he needed to upload images once and once only. So if a set of freshly shot images had to go in a PhotoShelter gallery for, say, client delivery, he was insistent that he should not have to upload the same images to WordPress for a portfolio slideshow or blog post. There are ways to embed a PhotoShelter gallery in a WordPress page or post but it nonetheless adds constraints to the development of the portfolio site and would not be the preferred way to display images. The good news is that for most photographers the rare uploading a handful of images to two different platforms is perfectly fine particularly with fast batch uploaders. If you are looking for a setup that maximizes the performance of your website go with a WordPress + PhotoShelter combination. It will require a little more work but the result will be worth it. WordPress is free open-source software available at WordPress.org that you install on your hosting account to run your website. WordPress.com is the paid-for hosted version, i.e. nothing to install and no need for a hosting account but you will need to subscribe to the service ($99 to $299/year depending on the plan you choose). Put it this way: WordPress.com is a service that hosts WordPress blogs. Beyond that the main difference between the two lies in the design and content organization freedom they offer. WordPress.org allows you to fully access the code which translates into more options to setup exactly what you want (as long as you know enough html, css and php). More importantly perhaps WordPress.org has spawned an enormous community of independent designers and developers that have created thousands of themes, plugins, code snippets and easy-enough-to-find solutions to almost all challenges. On the other hand WordPress.com doesn’t let you upload plugins and you can only use limited number of themes which you can not modify substantially. 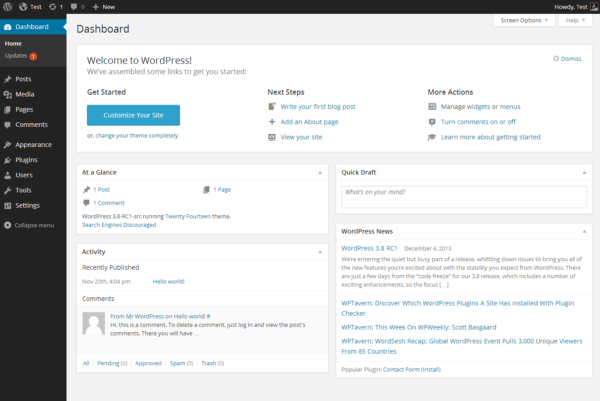 WordPress.com is a blogging platform rather than a content management system like WordPress.org. Here is a breakdown of the differences between wordpress.org and wordpress.com albeit it one that slightly oversells WordPress.com.